We live in a society which is slowly loosing its roots. Take this literally or metaphorically, it will still be true. We forgot the foods of our ancestors, the way they prepared those foods, or how to eat foods in season. I am sure that 80 % of people don't even know which produce is actually in season at their supermarket. garden. We canned fruit and veggies for the winter season and almost everyone had a root cellar to store onions, potatoes, cabbages, pumpkins, and a variety of root vegetables. Root vegetables were a staple in our winter cuisine - potatoes, beets, turnips, a variety of radishes, onions , garlic. When we think of healthy vegetables, or are told to eat our veggies, today, we often think of leafy greens (kale anyone), or broccoli, cucumbers and tomatoes. Those are all wonderful, but they are not the full spectrum of the bounty our mother Earth offers. Root vegetables are the forgotten powerhouse of the veggie world, They were pushed aside by exotic trends and visually more appealing foods. Sometimes they were vilified, and often simply neglected. Roots are often the most potent part of a plant. They store all the nutrients that feed the plant and help it grow. They have the ability to withstand difficult conditions and reach deep into the earth in order to be nourished and share her healing power. In herbal medicine some of the most powerful remedies come from the roots of the plants - dandelion,burdock, Valerian, blackberry, goldenseal. Some roots have made their way into our kitchens as potent flavoring agents, but we often forget their benefits. Onions, garlic, ginger - those are all roots/bulbs and they carry powerful medicine in them. They have strong antibacterial properties and can be used to treat common illnesses, like ear infections, chest cold, or even to boost the immune system.Sulfur compounds in garlic also help with heart health by improving circulation and regulating blood pressure. Ginger is great for digestion and adding it to heavier foods like meats or beans/legumes can improve the way your body handles these foods. One of the most vilified root vegetable is the potato. It has gained bad reputation in the health food world and a lot of people avoid it. What most people don't know about potatoes is that they are loaded with vitamin C, potassium and healthy fiber. It is all about preparing them right and avoiding the heavy sauces and condiments we usually use.I posted a great recipe for a German Style Potato salad a while back, find it here. If you are not convince that potatoes are good for you, you still don't need to ban them from your table. Mix white potatoes with other varieties like purple potatoes, or with other root veggies like yams, carrots and parsnips. Cut up a mix of potatoes, carrots, sweet potatoes, and turnips. (I like to use a ratio of about half potatoes and half other veggies). Bring them to a boil and let them cook until soft enough to puree. Depending on your dietary preferences you can mash them by adding grass fed butter, olive oil, coconut oil, or simply some of the cooking water. I like to season my mashed veggies with sea salt, black pepper and sometimes garlic powder. There is one root vegetable, which is gaining popularity as the health food movement becomes mainstream. It is the not so humble beet root! Beets get their distinct color from a phytochemicals called betalains ( unlike other purple/red vegetables , which contain anthocyanins).According to Dr. Weil "betalains, in addition to their antioxidant and anti-inflammatory properties, trigger a family of enzymes that bind toxic substances in cells, neutralizing and allowing them to be excreted from the body". Grate all the vegetables in a bowl. Chop parsley. Mix everything with lemon juice, olive oil and salt to taste. 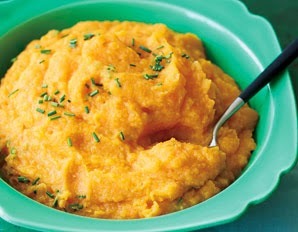 Yams and carrots are full of beta-carotene. Raw carrots are often used as a healthy , gluten free snack, but remember that only 3% of the beta-carotene is released to our bodies during digestion. This can be improved by 39% during the process of cooking. .
A more scary member of the root vegetable family is celeriac, or celery root. It is a little more difficult to deal with, since it has a harder texture and a sturdier, uneven outer layer of skin. I like celeriac mixed with other vegetables in homemade chips.My parents use it to add to sauerkraut or other fermented veggies. If you like the strong celery flavor, use it as an addition to soups and stews. Celeriac is a good source of Vitamin K , which is linked to healthy bones.It is also rich in phosphorus and copper, which support cell metabolism. 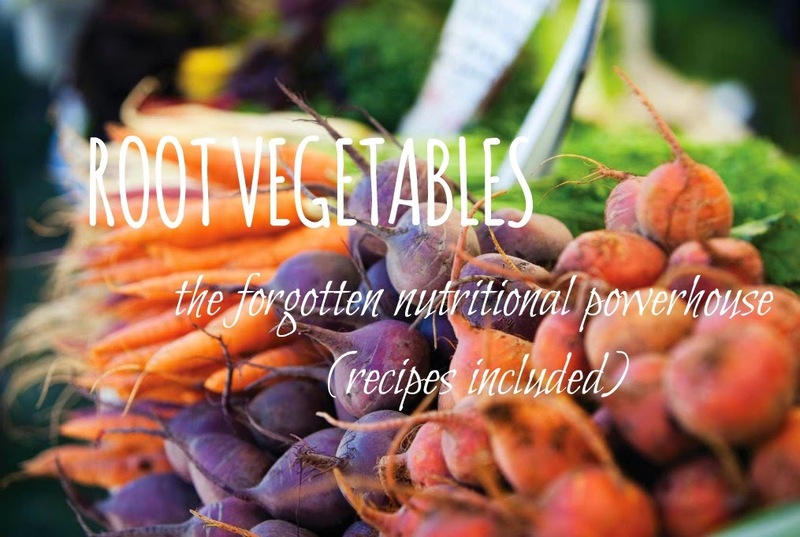 There is a much greater variety of root vegetables than I can mention in this blog. 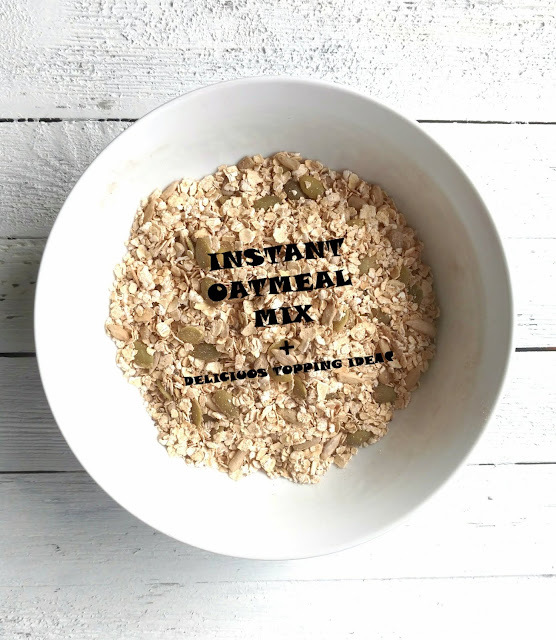 These are some of the few I use in my kitchen, which are also easy to find and incorporate in your everyday cooking. I use a few medicinal roots in my cooking as well - dandelion, burdock and horseradish.I like to infuse apple cider vinegar with those roots and use it as a condiment in soups . I also use roasted dandelion root as a coffee substitute. Dandelion and burdock have wonderful benefits for the liver and they add some bitterness , which improves digestion. Horseradish is one of my favorite ways to help any sinus congestion or pressure in the sinuses. It is also a great digestion help, which is why traditionally it was added as a condiment to heavier meals, containing red meat. Last, but not least, I would like to mention turmeric. We use this root mostly in a mix of spices , since it does not have a strong flavor on its own. When I was little , my grandfather used to add turmeric to noodle and rice dishes. It was fun for us kids, since it turned our food bright yellow. Little did we know that it is also one of the most powerful natural antioxidants. There are hundreds of studies showing the benefits turmeric,and its active compound curcumin, have for preventing disease like cancer, arthritis and Alzheimer's. It has amazing anti-inflammatory properties and is very beneficial for treating chronic pain and swelling. It seems as if I have touched just the tip of the iceberg. It is impossible to put all the benefits our food gives us in just a few sentences. 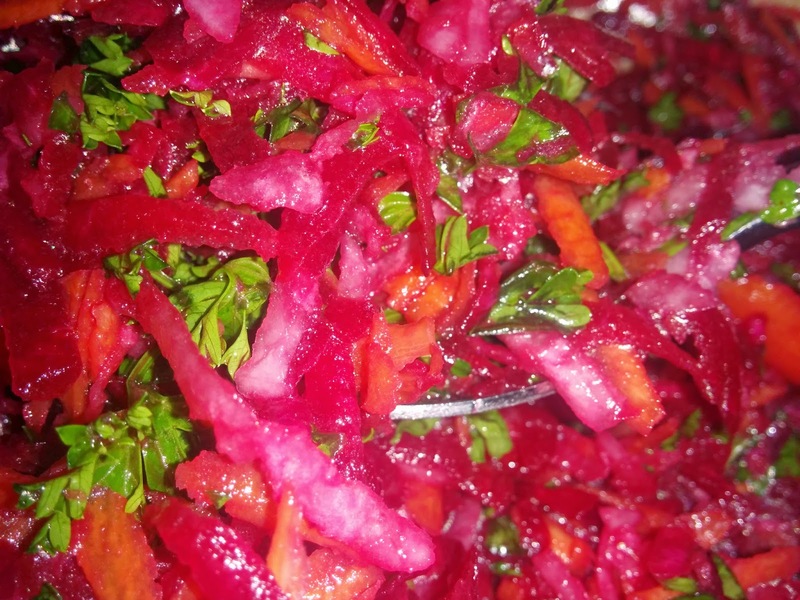 Still, I hope you are intrigued and inspired to explore the world of root vegetables.While I was writing this blog I did some major experimenting in the kitchen and I discovered how fun and satisfying it can be. Both recipes above are husband approved. It was a little harder to convince a four year old to try grated raw beets, but let's just say he is in a "cruciferous" stage. So give it a try,have fun and bon appetite!